Picking olives in South France offers you a cheap holiday if you don't mind rolling up your sleeves and pitching in. So where exactly is this farm and how to you apply? Read further and you will find out. You need a cheap holiday; the olive growers of southern Europe need a helping hand. There's a simple solution, says Carol Drinkwater, who joins the harvest in the Var. As I drove westwards along the A8, the purple hills of the Massif des Maures were rising towards a clear bluebell sky. Cradled within the Var between Fréjus and Hyères lies a bewitching hinterland, a low mountain range known in Provençal as Lei Mauro: the Sombre Ones. Even today, access to this thickly forested expanse is not easy. There are not many paths or roads, and villages and towns are few and far between. Less than two hours from Nice airport, the massif - once a smugglers' haven - remains a relatively mysterious land, racked by winds and aridity. Until half a century ago, the Maures slopes had been silvery with olive trees, but in 1956 disaster struck. February frosts dropped beneath minus seven and the trees were blighted. Many farmers dug up their groves and replanted them with vines, but a few clung to the knowledge that the olive is the tree of eternity; they cut back the damaged trunks and waited for new shoots to appear. I was on my way to an olive farm some English friends had recently bought near Cuers in the Plaine des Maures. This was to be their first harvest and they were struggling; the 60 trees were already dropping their fruit. It was only late October, usually considered too early to harvest. I stopped in the little town of Brignoles (Brignolo in Provençal) to buy gifts, but it was lunchtime. Everywhere had closed. I strolled the empty streets, passing a faded sign, hand-painted on a building, advertising Noilly Prat vermouth - classic Provence - to Le Café de l'Univers in the main square where a blackboard offered the dish of the day at €8.50. The sun was shining and there was not a tourist in sight. The clock on the Hôtel de Ville was 10 minutes slow. People were rising from tables, wandering off to buy copies of the Var-Matin, leaving their bags. No one seemed bothered about theft. During these brief, out-of-season months, the Provençal communities seem to return to their former selves. A freshly baked loaf, big enough for four, was placed in front of me. I ordered the chef's special, roe deer. I rarely eat game, but I opted for the seasonal dish. To accompany my sauté de Chevreuil à l'ancienne et pâtes armonières, the waiter delivered a pitcher of organic red from the nearby Domaine La Lieue. My bill was €17. Back along the country lanes, smoke columns rose, rich with autumn perfumes. Late October was busy with clearing and burning. The grapes were pressed, the chestnuts, a local specialty, had been harvested and the olives were still to come. My friends' farm is buried at the remote end of a winding, rutted track semi-circled by purple mountains. When I arrived, Clive and Sarah were in the groves laying nets at the feet of their trees. They were being helped by two young Americans I had recommended. Tommy and Shawna had both helped at my own olive farm overlooking the Bay of Cannes. When we bought it more than 20 years ago, the house needed complete renovation and the land was a jungle. It was two years before we could afford to cut back the 10 acres, and then we discovered we had 68 400-year-old olive trees. We planted another 200 saplings and today we have an appellation d'origine contrôllée for our oil. The four of them waved as I approached. Tommy and Shawna had met at my place on the WWOOF programme. World-Wide Opportunities on Organic Farms offers first-hand experience of organic or ecologically sound farming to those who might not otherwise encounter such environments. It is also intended as a meeting point, where living together is an exchange of languages, cultures and ideas, and it offers the volunteers the opportunity to explore new countries while sharing in the lives of rural communities. Anyone can join, whatever their age, background or experience. "WWOOFers" pay nothing for their accommodation. It's a chance to travel, participate and beat the current financial downturn. I was trying to persuade my British friends to convert their barn into sleeping quarters and sign up as WWOOF hosts. All over the Var and the Alpes-Maritimes, farms are opening their doors to volunteer workers. It's a brilliant arrangement which, for me, echoes the traditions of olive farming. The harvesting of olives is a social event, bringing together families and neighbours to gather, eat and celebrate a crop that has been a cornerstone of Mediterranean cuisine and livelihoods for thousands of years. Clive and Sarah's trees were a mere 30 years old and had been pruned hard so there was no need to climb tall ladders to reach the fruit. The work is not dangerous, though it demands full days and is painstaking: picking each fruit individually, rather than beating them off the branches with batons, you discover muscles you never knew you had. Hours can be spent on hands and knees collecting fallen olives into baskets, but the tasks are usually achieved in the sunshine and mealtimes are convivial and hearty. Once the nylon nets had been correctly positioned - reaching to the branches' farthest tips in order to capture all falling fruit - we adjourned to a wooden table outside the barn where our host opened a bottle of Côte de Provence rosé. "We were unprepared," worried Clive. Here in Provence, the adage is that Ste Catherine's day, November 25, is when the oil-rich fruit is ready to gather. Mills rarely press before the third week of November. But by late October Clive's olives were black, falling and being gobbled by birds. Along the roadsides I had observed other farmers laying nets in readiness, and fortunately not 30km from Clive's farm I had also discovered a mill, Moulin Loube, which was ready to start pressing the following day; farmers were already queuing to turn their early-season fruits into oil. I suggested Clive book an appointment and we'd work as a team. Although my own olives were calling, I offered to help bring in the crop. Before setting to work we made a swift trip to Le Luc, to the estate of Guy and Anne Meulnart, whose domain, La Bernarde, produces some of the finest mixed-variety wines in the Var. Although I had never met this couple, they greeted us like long-lost friends. Their vendage had been completed mid-September, three weeks ahead of schedule. Due to lack of rain the quantity of wine delivered was worryingly low but the quality, Guy assured me, remained excellent. It was 35 years since this winery had used pesticides, but they had never applied for organic certification. Too much bureaucracy, said Anne in her smoky drawl. After a tour of their pristine caves, we staggered out cradling magnums of superb red. Over the following days, from dawn to dusk, we picked olives by hand, stretching, reaching from stepladders, careful not to bruise the fruit lest they bleed their oil and grow mildewy and acidic. I set aside some of the best fruit for bottling as table olives. These we washed thoroughly and left to stand for four days in water, refreshed daily, before pickling in brine and bay leaves for several months. The weather was mild and sunny, the mood upbeat. We cooked as a team - grilling local Sisteron lamb chops, baking Mediterranean bass with herbs from the garden - ate by candlelight at a big oval table in the kitchen, opened Guy and Anne's exquisite magnums and talked until after midnight. Each day's haul averaged 80 kilos of fruit. Not bad for novices. Once the harvest was in, Clive and Sarah delivered their 18 brimming crates of olives to the Moulin Loube, and I accompanied Tommy and Shawna to the chestnut fair at nearby Gonfaron, where le primeur est arrivé - the local alternative to beaujolais nouveau. The cooperative was offering tastings and bottles were on sale for €4 apiece. In another week or two, their shelves would also be lined with the new season's olive oil. Moving through the throng of Provençals poring over stalls laden with marrons glacés and olive oils - I bought two jars of rich chestnut honey - we continued on to the Tortoise Village of Gonfaron. This area's low-lying mountains are famed for their colonies of Testudo hermanni hermanni, Hermann's tortoise, fast becoming extinct in France due to forest fires and urbanisation. The village's man-made enclosures replicate the tortoises' natural habitat and they are free to roam while remaining carefully protected against predators. Although the village's primary aim is the conservation of its native breed, it also boasts 1,500 examples from 20 other tortoise species, some of which hail from as far afield as Madagascar. The park, open all year round, offers an excellent outing for children, particularly as there is a donkey sanctuary across the lane. Sarah and Clive, triumphant with 57 litres of oil fresh from the mill, met us in the old town of Collobrières, the capital of the Maures. Perched on a rocky spur, Collobrières is where France's cork industry (taught to them by the Spanish!) was born. After lunch at La Petite Fontaine, washed down with rosé from the town's cooperative, it was warm enough to sit out beneath the plane tree, which was shedding leaves the colour of ripe pears. My friends proudly presented me with a bottle of their first season's oil. We said our farewells. Tommy and Shawna were intending to spend some days trekking the Var hinterland, while I was returning to my olive farm to prepare for our own harvest. All promised to lend a hand. 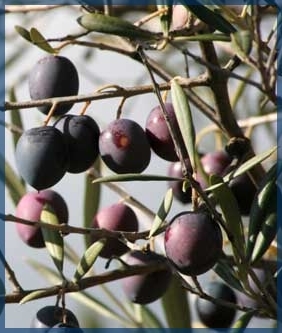 • Carol Drinkwater's The Olive Tree: A Personal Journey Through Mediterranean Olive Groves is published this week by Weidenfeld & Nicolson, priced £18.99.